Imperial and xeno walkers wrestle on the outskirts of the Barad Mine. IMPERIAL VOXCAST (3 294 736.M41)—Imperial troops launched a successful attack on the ork-held Barad Mine yesterday, Imperial authorities have announced. The assault on the key industrial site to the southwest of Susa City was launched at dawn of 3 291 736.M41, with armored units attacking the eastern edge of the mine complex while infantry stormed the northern suburbs. Xeno opposition was less effective than expected. Although fighting was fierce at times, Imperial officials reported, the xenos appeared reluctant to face the powerful firing line presented by Imperial forces. Early in the battle, orks along the eastern edge of the mine complex made what Gen. Vectrix called a “half-hearted” advance on the Imperial armored column moving forward. Trukks and looted Chimeras roared over a sizable ridge dominating the battlefield, but, after the vanguard of these xeno vehicles were destroyed by long-range armor and lascanon fire, the orks withdrew. 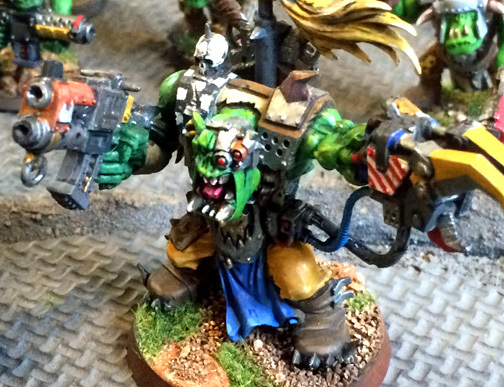 The unidentified warlord of the ork horde. The brute was struck down by a lascannon beam in the final stages of the battle. For much of the rest of the day, this portion of the ork line was uncharacteristically quiet–at least on the xeno side. Imperial forces took advantage of this lull in close-in fighting to launch a bombardment of more than 300 artillery pieces at the ork-held ridge, hurling tons of shells into the massed ork formations that milled impotently behind the ridge. 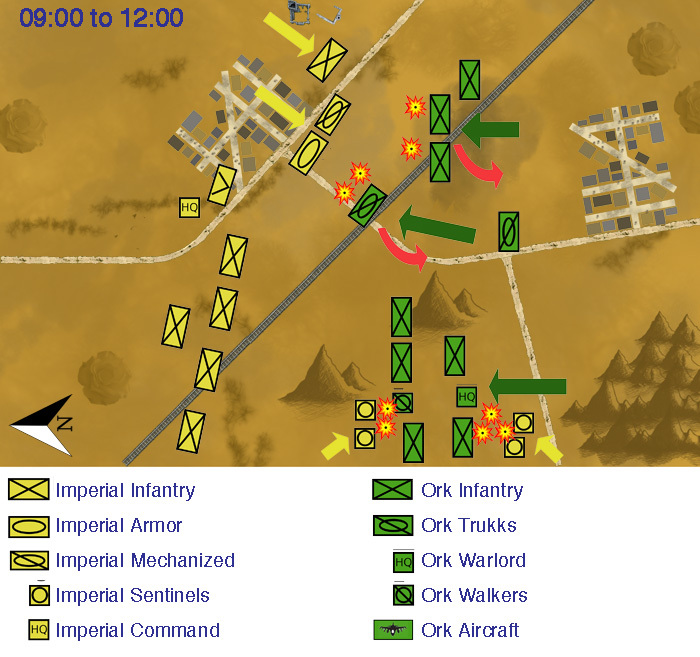 The bombardment lasted four hours, with ork losses estimated in the thousands. Along the northern edge of the mine, however, the situation was far more dangeorus. A sizable body of ork infantry launched a major attack, apparently seeking to overwhelm the right flank of Imperial forces with numbers. But a surprise flank attack by armored Sentinels disrupted this threat. Gen. Vectrix described this flank attack as critical to the battle’s victory. Several Sentinel squadrons moved to block the ork advance, while others swept in behind the orks to force them to turn and address the threat. Fighting was reportedly fierce. The Sentinels were highly successful at first, their heavy flamers slaughtering hundreds of orks with fiery columns of holy promethium. The ork warboss reportedly was forced to turn back with his armored guard to deal with the Sentinels to his rear, while several ork walkers were forced to engage the Sentinels to their front in a frenzied melee of mechanical claws. The Sentinels to the rear eventually were destroyed, Imperial authorities admit, in a “heroic” last stand that seriously disrupted the ork attack. To the front, the Sentinel attack also delayed the ork advance, allowing long-range infantry and artillery fire to destroy large swathes of the enemy and degrade the threat of the xeno attack. Imperial authorities were at a loss to explain the lack of agressiveness usually shown by the green-skinned xenos during the battle. Gen. Vectrix suggested that the growing prevalence of armor and anti-air units in the Imperial army could be a major factor. By the middle of the day, with the orks skulking behind their defenses to the east, Imperial armored units finally advanced and moved westward, seeking to strike the flank of the ork advance along the northern edge of the mine complex. Hellhound and Chimera squadrons quickly penetrated the ork flank and drove it back. 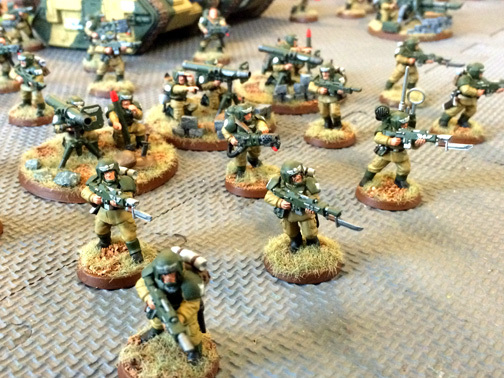 Guardsmen with the 728th Cadian Regiment advance as they drive the ork invaders out of the Barad Mine. Late in the day, in a seemingly desperate act, the orks began a last-ditch attack centered on the Imperial armor. 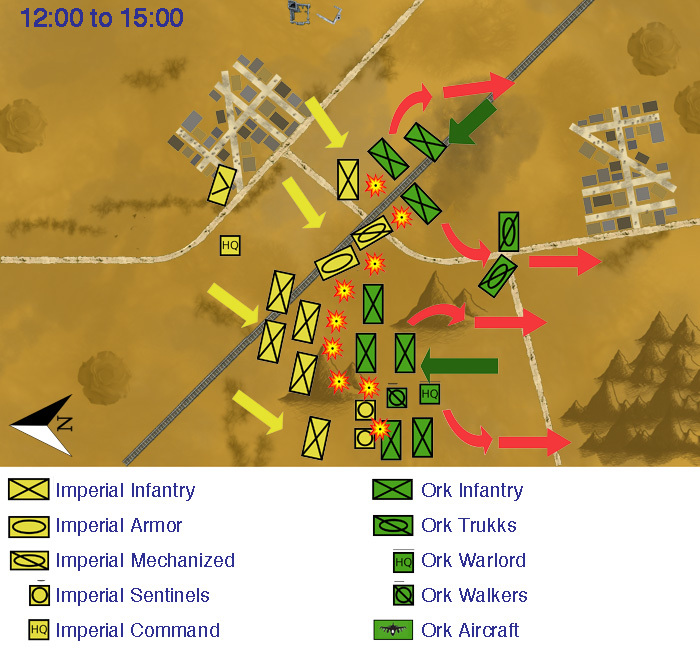 The fighting that followed was frenzied and, at times, opposing troops were only meters apart as they battled. Heavy casualties were reported on both sides, but in the end, the orks were repulsed. Imperial: Three objectives (8 v.p.) + First Blood (1 v.p.) + Kill Warlord (1 v.p.) = 10 v.p. TheGM: The retaking of the Barad Mine significantly reduces the risk that the Gaffer will conquer Hegira (at least any time soon). The terrain rolls fell my way, allowing me to create a deadly swath of open ground in the center of the battlefield. This tactical advantage, coupled with the fact that the Gaffer hasn’t found a practical counter to my armored units, seemed to discourage the ork commander from his traditional right-in-your-teeth attack. I must say, my luck with the warlord trait, which allowed me to send my Sentinels on a flank attack, proved extremely valuable. For variety’s sake, I had taken a lot of armored Sentinels, and it was very disruptive to the orks to have Sentinels with 12-strength front armor appear right in front of the ork main assault—while others appeared to their rear. The fact that they all opened up with heavy flamers, which have proven very deadly to ork concentrations, completely disrupted the ork attack. And that’s a necessity when facing orks. Not only did the flamers cause massive casualties, they forced the orks to deal with the threat—and that allowed my infantry and artillery crucial time to just pound away. Rarely does a battle go my way like this one did. I hope the Gaffer wasn’t offended by my “happy dance” and “nana-nana-nana” taunting at battle’s end. 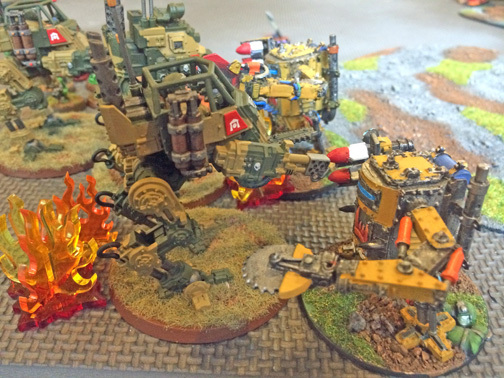 The Corvus Cluster is a hobby blog documenting our wargame adventures in the fantastical sci-fi world of Games Workshop’s Warhammer 40K. On a roll way to go. Go GM beat the Xeno scum.